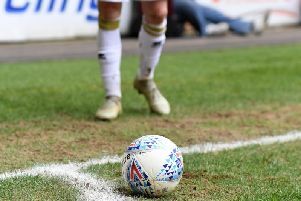 Referee Ross Joyce 'didn't stand up' to the pressure of The Den on Saturday as a late penalty decision cost MK Dons a share of the spoils with Millwall on Saturday. Lee Gregory bagged a brace for Millwall, the second of which came in stoppage time from the penalty spot after he was adjudged to have been fouled by Paul Downing, to win it for the home side. But the game was spiralling out of control for the final 25 minutes as fouls and bookings were dished out on both sides. Dons boss Robbie Neilson said his side were fully deserving of at least a point in London, but felt Mr Joyce's decision to award a penalty in stoppage time lacked experience. "To be fair, (Gregory) does really well," he said. "He gets across my defender, grabs his arm and pulls him down with him. He's made the referee make the decision. If it was my player, I'd be delighted with him. "You'd hope the referee would be experienced enough to handle the game and see these things, but we didn't have that today. "With 25 minutes to go, I think the referee started to lose control of the game. It's a tough place to come for the players, and it's tough for referees. And he didn't stand up to the game. We needed a strong referee who makes the right decisions, who won;t be intimidated or pressurised and losing control. Today, he didn't stand up to the game. "This is a phenomenal place to come, I really enjoyed it. The atmosphere was great, you need strong players with good characters and a referee who can handle the pressure. We had two out of the three - that's why it wasn't a great game." Long balls were the order of the day on the balding and bobbling surface, making a passing game almost impossible for both sides, much like the Valley Parade pitch on Tuesday night in Dons' 2-2 draw with Bradford. Neilson added: "In the balance of the game, we didn't give up a lot of chances. We only let one cross in to the box in the first half and they scored. We created two really good chances in the second half, we didn't take them and we paid the price for a poor refereeing decision. "It was always going to be tough coming here - they don't lose a lot of goals, they go direct and make it difficult for the defenders and put them under pressure, but we stood up to it well. I thought the defence really good. I couldn't ask any more from them. But one decision from the referee swings the game." While five points from the last week would have been a solid turnaround, considering trips to play-off contenders Bradford and Millwall in the offing, but Neilson was philosophical, despite feeling his side deserved a lot more. He said: "We came into these three games looking for nine points, and we didn't get it. Today was always going to be tough, as was Bradford away. "We've handled ourselves really well and at no time did we look like we were going to get turned over. We've also had chances to win it. We should be sitting here with more points but that's football."